Building on the strong foundations of their excellent debut, 1972's "Can't Buy A Thrill", this is again an album packed full of high quality musicianship and an uptempo jazz-influenced rock sound. The lyrics, once again, as indeed always, were impossible to analyse - references to drugs, excess, Buddhism, West Coast living and wealth swirl around without ever having any obvious meaning. They are just there, thoroughly intriguing and the perfect match to the music, which actually has the same effect. Again, the influence of this album was immense. Joe Jackson stated that this album had more influence upon his work than any other. 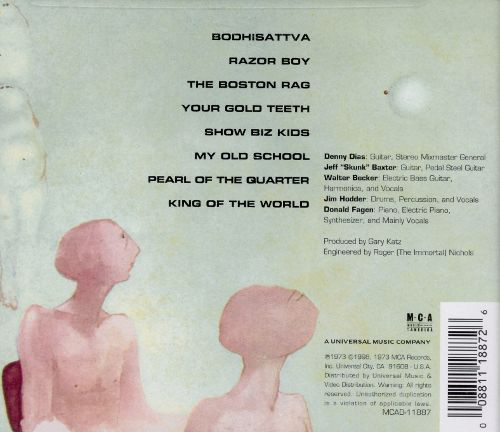 "Bodhisattva" is an absolute treasure, full to the brim with jazzy guitar riffs, vibrant rhythm and an exciting, energetic blues meets jazz meets rock feeling to the whole thing. A beguiling vocal, exhorting a the Buddhist deity of "Bodhisattva" to begin each verse. The song is fast-paced and very poppy, yet finds time for various jazz solo parts. A thoroughly delicious cornucopia. 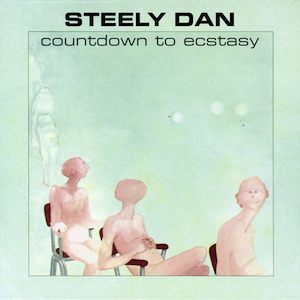 One of my favourite Steely Dan tracks. "Razor Boy" is a syncopated Latin "Do It Again" groove ushers in this mid-pace, together with what sounds like some jazzy "vibes" and some great piano underpinning a somewhat cynical lyric about a "razor boy taking all your things away on a cold and windy day". "The Boston Rag" his a stunning electric guitar intro twinned with acoustic guitar leads us into and an anthemic chorus following some typically plaintive Donald Fagen vocals on the verses. This is a magnificent slow burner of a rock track with some heavy guitar parts throughout and then the best bit - a distinctive piano and guitar interplay section mid-way through. Then the drums kick in and the heavy, almost distorted guitar. Instrumentally sublime. It gets even better on "Your Gold Teeth" - lovely Latin rhythms and percussion backing this one. Harmonious vocals and more mystifying lyrics - just who was Cathy Berberian? An avant-garde composer, apparently. An excellent mid-song instrumental break with some stunning guitar once again, together with some jazz piano and frantic conga work. There are definite hints of Gil Scott-Heron’s 1971 “Lady Day & John Coltrane” in this song’s funky organ sound. "Show Biz Kids" is an insistent, grinding almost bluesy number played out against the repeated backing vocal of "You're going to Lost Wages..." and a lyric about people wearing "a Steely Dan t-shirt" amongst other things. As always, the featured guitar is peerless. There is just such a hypnotic groove to this one. The point where the verse begins about "show biz kids making movies of themselves" is one of the high points of the whole album. "My Old School" is the album's most "commercial" track - upbeat summery rock amongst what are mainly "album tracks". An irresistible hook in the chorus, catchy verses, punchy horns, strident piano, some searing guitar in the middle and throughout, to be honest. Lyrics about "never going back to my old school" and, continuing the oblique tradition of mention past English monarchs, "King Richard" and "King John" from the previous album are joined here by "William And Mary" for some inexplicable reason. "Pearl Of The Quarter" is a pedal steel guitar backed evocative and catchy song about New Orleans with a laid-back jazz rock groove and "voulez vous", Cajun-inspired lyrics. Covered by Boz Scaggs on his 2013 "Memphis" album. Shuffling percussion and funky wah-wah guitar introduces "King Of The World", the closer. This was the first track that saw "The Dan" truly getting funky. Trademark vocals and lyrics over a solidly paced infectious beat, with some nice bass runs and keyboards too, along with some strange noises at one point. Quite an unusual track compared with those that had come before, both on this and the previous album. Instrumentally adventurous. A good way to end a superb album.